Friendship is one of the most important and valuable things. 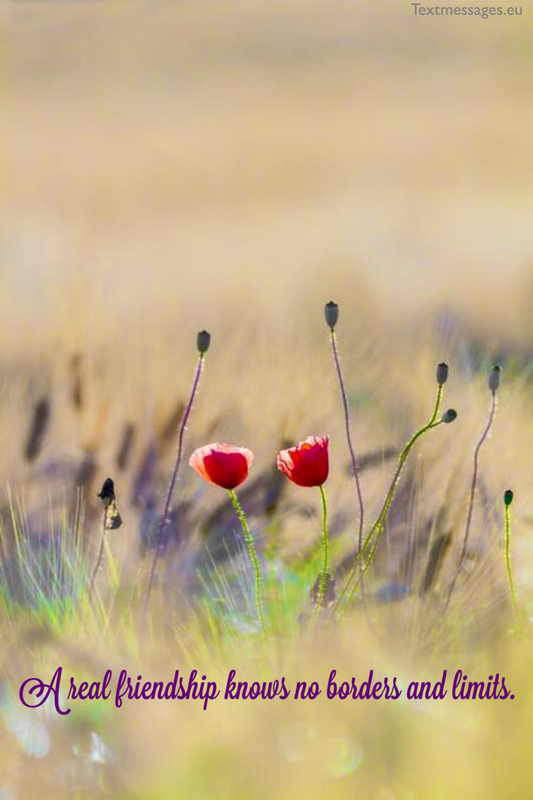 All of us need friends to share our thoughts and feelings, our happy and sad moments of life. 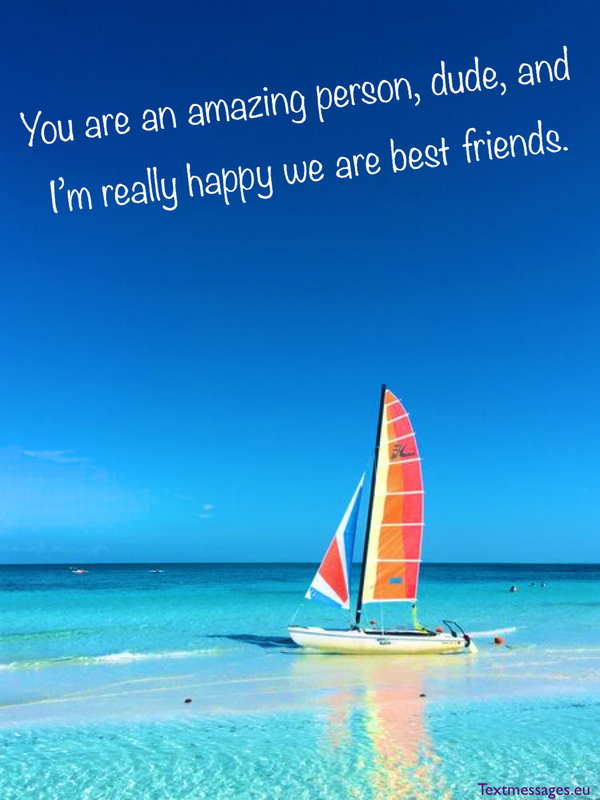 Let them know how much they mean to you by sending them cute best friend quotes, best friend wishes and sweet cards. 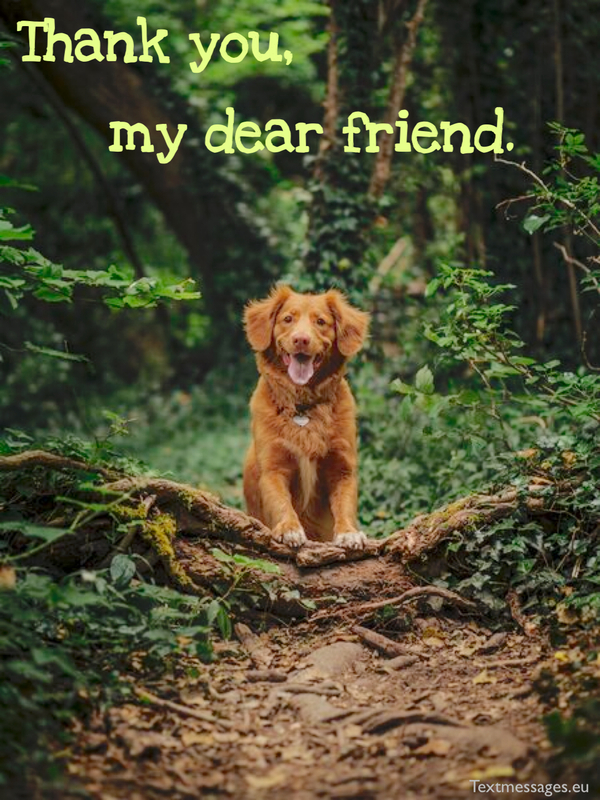 Lots of best friend messages with images you will find on our page. We met each other in this cold and unfriendly world on purpose. Together we are able to fight against all odds and sorrows. 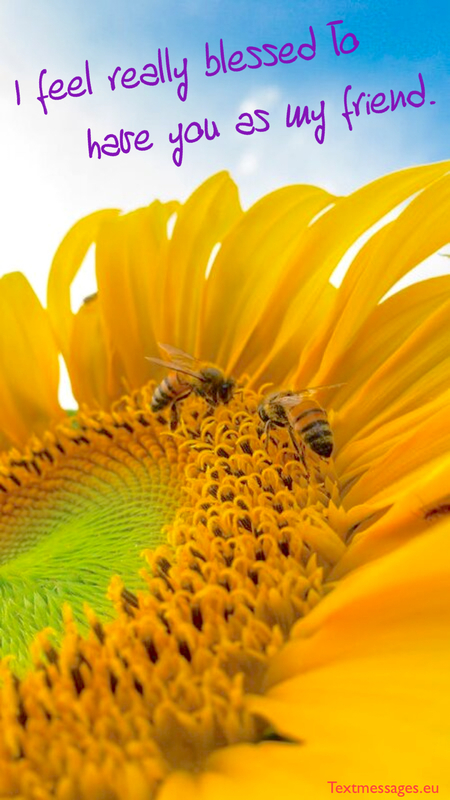 I would never achieve happiness and success without your support and wisdom. Thank you, my dear friend. I still remember the first time we met. The first thought that occurred to me was: “Oh, this dude is so cool, we would definitely get along great”. And I was right! Many years have passed since then, but we are still best friends and I still think you are the most amazing person in my life. You are the one I always go to when I’m confused and need a piece of advice. You are the one I always go to when I’m spiritually exhausted and need to regain my strength. You are the one who can make me laugh even though I am sad and blue. You are my best friend, and I will never ever trade our friendship for anything else in the world. Sometimes I perceive ourselves as a whole, as two parts of one soul. Because I know everything about you, and you know everything about me. We don’t hide secrets from each other. Our friendship is pure, transparent and genuine. I’m really proud of it. Anyone can be a friend, but not every person can be a good friend. Those who think that being a friend is easy, are gravely mistaken. Being a good friend requires you to be kind, patient and sometimes to sacrifice your own needs and wishes. It’s hard to become a good friend, but I’m learning this art with a magnificent teacher, and it’s you, buddy. I feel truly blessed to have such a wonderful person in my life as you are, my friend. While all the other people come and go, while everything changes, your presence in my life remains permanent and irreplaceable. I wish it would always be this way. It doesn’t matter how bad my day is going, because I know that I have a person who can fix everything in the blink of an eye and make things right again. And this precious person is you, buddy. I believe that we should really appreciate people who make us smile. And you always make me laugh so hard that it stings in my stomach. You are an amazing person, dude, and I’m really happy we are best friends. Nothing can stop me from being your friend. Even though we fight sometimes and have misunderstandings, you are still the closest person to me. Difficulties make our friendship stronger, and I promise to do everything I can to preserve it for many long years. Because it means a world to me. We’ve been friends since we were kids. It’s funny to watch us grow up and change, while our friendship remains just the same. I’m so happy that we have each other, because this is one of the few things that make me believe in miracles. Best friend is like the ray of sunshine in the darkness. When storm clouds of life are gathering and it seems that there’s no hope, the best friend will always come to you and light your way out. Many people use the word “friend” every day referring to their mates or simple acquaintances – in other words, the people they don’t even know. And it what makes friendship so cheap nowadays. The word “friend” is beautiful, majestic and full of meaning, that’s why we shouldn’t neglect it. Admitting that you have the funniest, the smartest, the most honest and loyal friend in the world is a complement not only to your friend, but to you also. When we are happy, we want to share our happiness with someone close and dear to our heart, because we know that it’ll make him happy too. When we are upset, we also want to share our sadness with someone who’s able to change our mood for the better. And this someone is the best friend. Sometimes a true friend can be closer to you than your own family. Sometimes he can understand you better than you can understand yourself. A real friendship knows no borders and limits. Best friend is someone who can sacrifice for you a lot and do for you many things that he can’t do even for himself. Real friendship is a great gift and a curse at the same time. 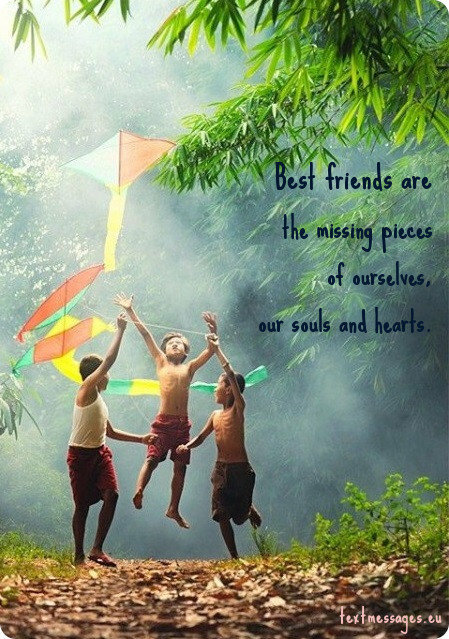 Best friends bring much pleasure and joy to each other. But if you really want to have a strong and long-lasting friendship you also have to take on the responsibilities, because being a good friend is very, very hard. The truth is that we need our best friend all the time, not only when we have difficult times in our life or in the moments of joy. We should always think about our friend and concern about his well-being. The best friend, who betrayed you or traded you for someone else, was not your best friend at all. He is not worth of crying and suffering. 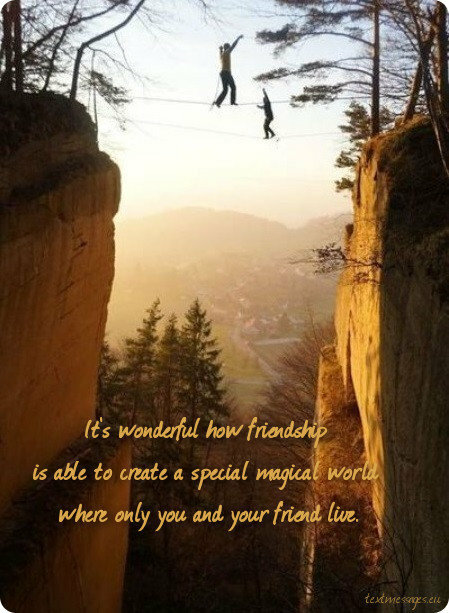 It’s wonderful how friendship is able to create a special magical world where only you and your friend live. This world is full of common interests, points of view, humour, jokes and secrets which only you can understand. Best friend is someone you are not afraid to call in the middle of the night and cry your heart out. He will never shout at you or something – he will listen to you very attentively and then offer his help. Sometimes I feel like me and my best friend are either the same person or have a special connection. When my friend’s happy, I’m happy too. When my friend gets hurt, I feel his pain too. I always feel the same as my friend does. Best friend will never try to change you despite he understands you’re not perfect. Best friend is like a mother – he loves and accepts you just the way you are. And even more – he turns your drawbacks into advantages. The best way to know if your best friend is a real one is to see what he will tell other people about you after a fight. 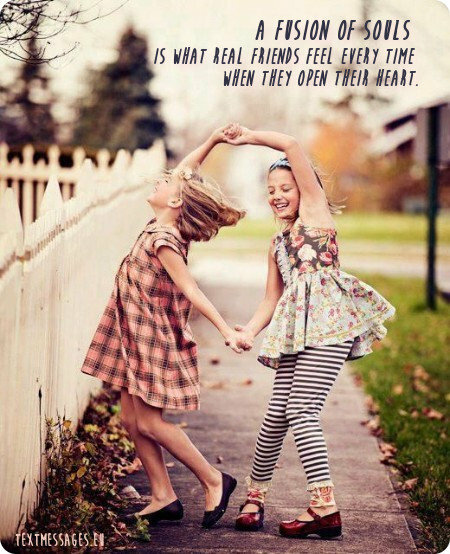 There’s no former best friends – real friendship is for life. 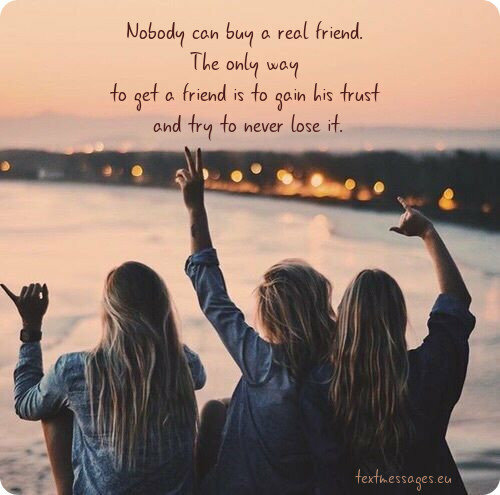 Nobody can buy a real friend. The only way to get a friend is to gain his trust and try to never lose it. They say that the most significant and dearest people for us are those whom we think about first when you wake up. And you are one of these people, because you’re my best friend, my soul mate. When your best friend comes, you’ll make the most delicious dinner to delight him. When he says that he’s leaving, you’ll make everything that is possible to make him stay a little bit longer. When he says that you’re the best friend of him, it’s enough to make you happy. There’s only one best friend. Not four, not three, not even two – only one. But this friend costs a hundred of so-called friends. Remember that he’s the only one for you on this planet and take good care of him as hard as you can. Sometimes you don’t need to explain your feelings – your best friend will understand you without a word. Sometimes you don’t need to explain yourself – your best friend knows you even better than you know yourself. understanding and forgiving. It is the knowledge: „When you need me, I will always be there for you“. 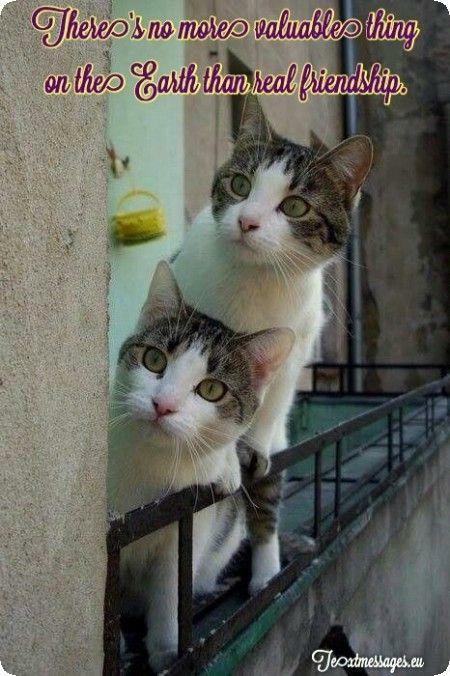 You realize that your friend is really close and dear to your heart when you can’t stand telling everyone around you how great, intelligent and funny your friend is. You never envy you friend – you’re really proud of him. Being best friend is not that easy. It is not something we can be taught – it’s something we should learn and comprehend ourselves. But in the long run it’s the most useful and beautiful knowledge in our life. Just a talk and a nice walk around the city with you is enough to make me a little bit happier. You know the secret buttons of my soul and you know which one you should press to make me feel good. You know me better than I do, and I’m grateful to you for it. Sometimes I think that our friendship is the Eighth Wonder of the World, because it never ceases to amaze me with its incredible depth and versatility. I believe our friendship will last forever and, probably, we’ll become best friends in our future lives too. I bet it! 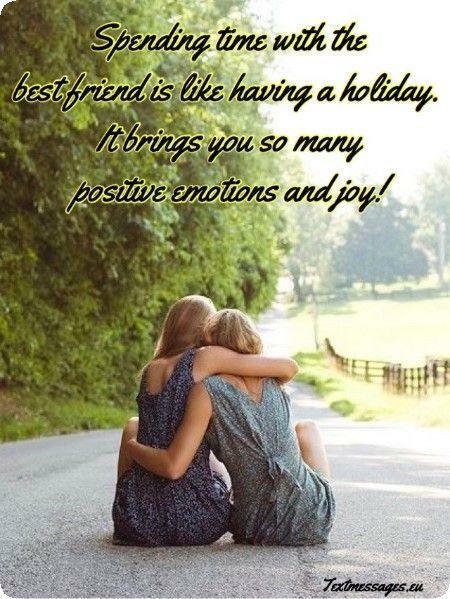 Spending time with the best friend is like having a holiday. It brings you so many positive emotions and joy that you can’t forget it for a long time. 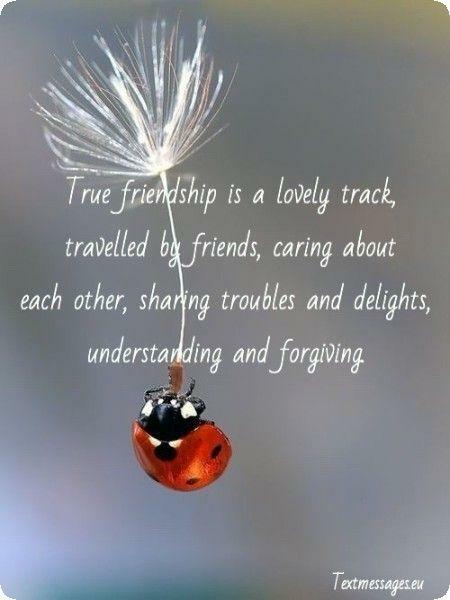 True friendship brooks no lies and selfishness. It’s a real blessing if you know how to treat it right, and it’s a curse if you neglect or don’t appreciate it. I wish I would never let our friendship come to an end, because there’s no life for me if I lose you. Lovers come and go, but true friendship persists. It was you who always was my crying shoulder and my support. It was you who led me through the dark times to the light. It is you whom I never betray or let down. I promise. You are the only person who lets me be myself. You know the real me and you love me for who I am, even though I’m not the best person. In the world of short-term and empty relationships, I’m so glad we’ve found each other. You will never be lonely, because I will never let it happen. We have been through so many things together. We had our ups and downs, we shared happiness and sorrows together. You have always been with me in the most significant moments of my life, and it means a world to me. To make one hundred friends in one year is not a great achievement. 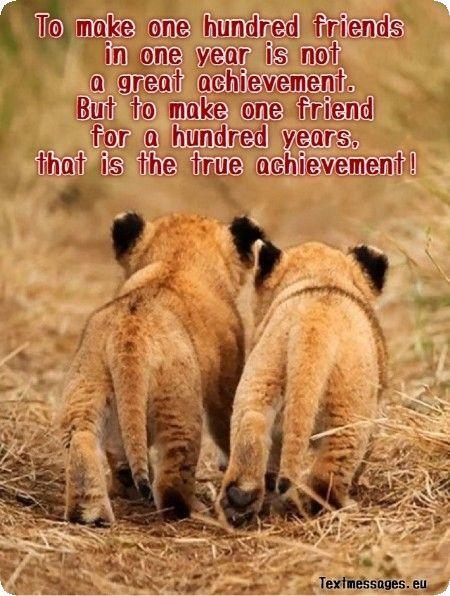 But to make one friend for a hundred years, that is the true achievement! What is friendship? It’s when you pick me up in the middle of the night because I’m drunk. It’s when I have an urgent matter to discuss and you are eager to listen to me at any time of the day. It’s when we can’t spend a day without talking to each other. And it’s when we don’t need to open our mouths to speak, because we understand each other perfectly without it. I like many things about you, buddy. I like your laugh, because it always makes me laugh too. I like your thoughts and vision of the world, because it kind of expands my own outlook. I like the fact that you consider me your best friend, because it’s a great honor for me. Although we are miles away now, I never stop thinking about you and try to catch every opportunity to talk to you. And I’m really looking forward to seeing you soon, because I feel like I’ve been missing you a lot recently, buddy. I’ve heard that complete understanding is impossible, but I think we are an exception. Somehow you can understand we even without words. I guess, you feel me with your heart, and so do I. We are a perfect match, and I don’t want to lose our precious friendship. 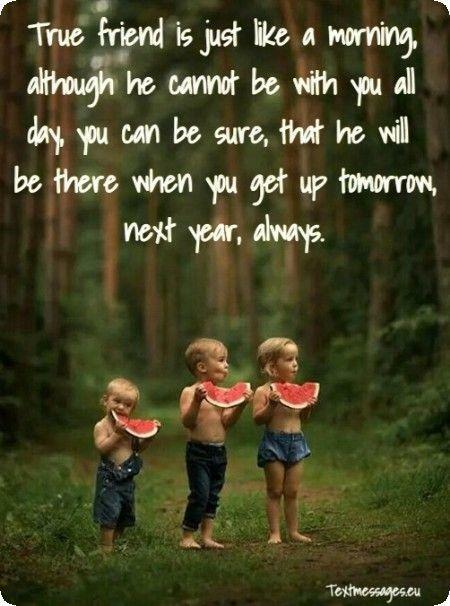 You can be sure, that he will be there when you get up tomorrow, next year, always. When I have something big and important happening in my life, I always want to share it with you. You are the person I always go to. You are my friend, my soulmate, and I’m more than happy to share my life with you. Sometimes I think I had known you long before I met you. You seem so close and so dear to me that I start considering that we were friends in our previous lives. 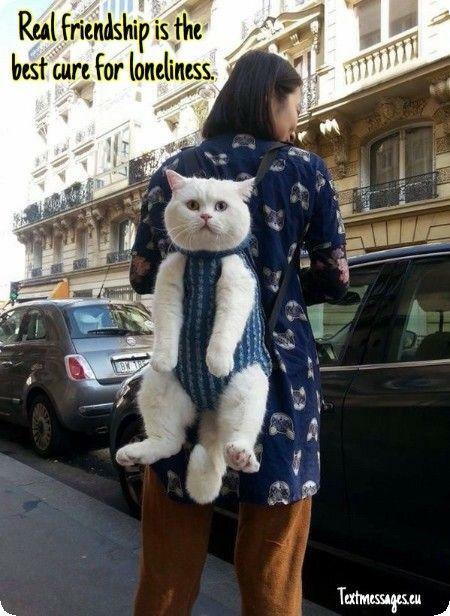 It’s a crazy idea, but there’s no other explanation. I’ll be there for you every time you need me, buddy. I don’t mind at all to be your crying shoulder or your punch bag – everything it takes to make you feel alright. Just know that. We are the best dudes in the world, because we have each other. Together we are able to move mountains and to have a really great time. We fit together just as we are two puzzles of the same picture. I have an amazing feeling that we met on purpose. Friendship is like wet cement – the longer you stand on it, the harder it gets to leave and you can never go without leaving a footprint. Friends exist to help each other and cheer each other up. Friends exist to tell the truth, when the rest of the world is lying. Friends exist to be role models for each other. And you know what, buddy? We are the best example of totally perfect friendship. Some people believe in luck, other people believe in love or power. 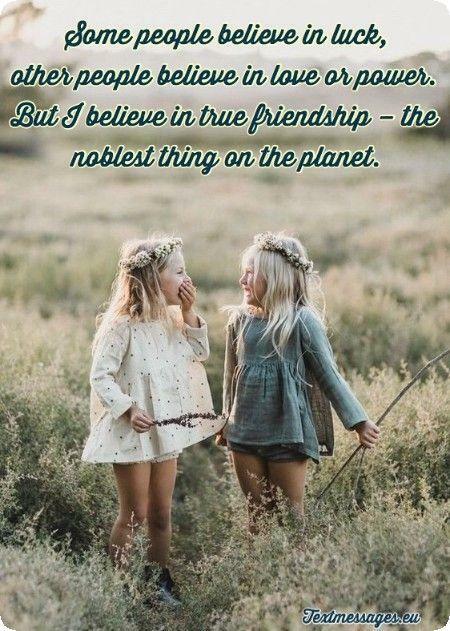 But I believe in true friendship – the noblest thing on the planet. 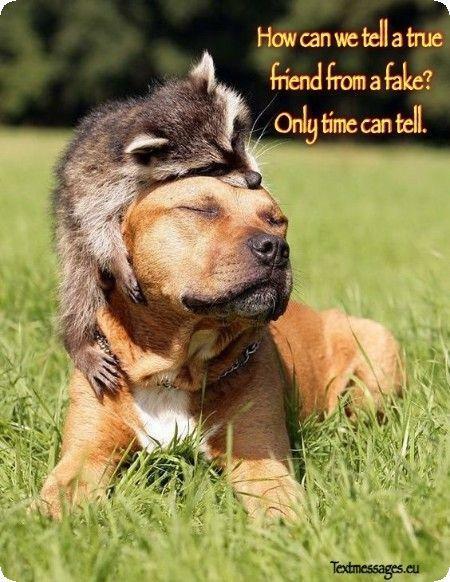 How can we tell a true friend from a fake? Only time can tell. The only thing we can do is try to be patient and never judge our friends too strict but at the same time we shouldn’t allow them let us down. 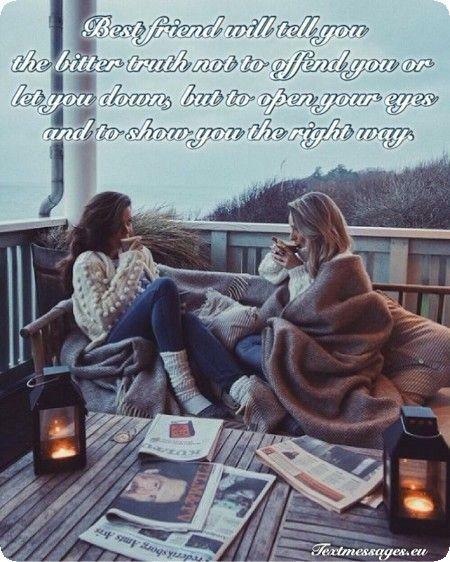 Best friend will tell you the bitter truth not to offend you or let you down, but to open your eyes and to show you the right way. 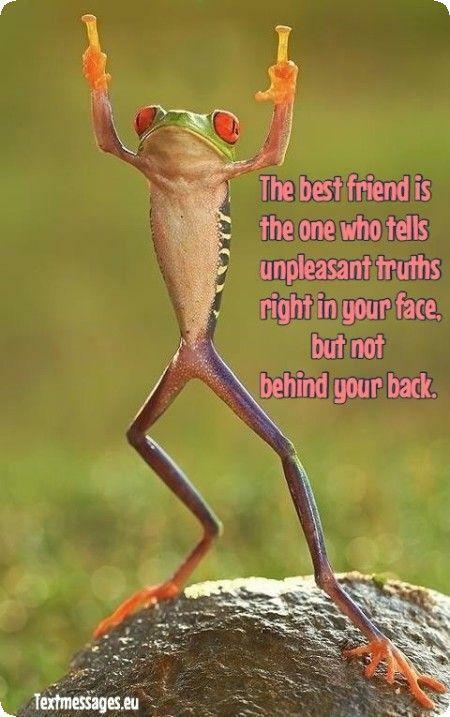 The best friend is the one who tells unpleasant truths right in your face, but not behind your back. 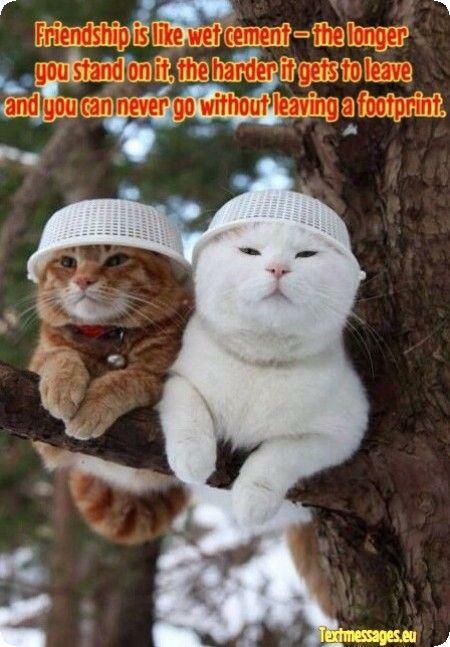 Friendship is like a tree. And it depends on you whether it’s going to be a strong, mighty and healthy tree or a weak and sickly bush. 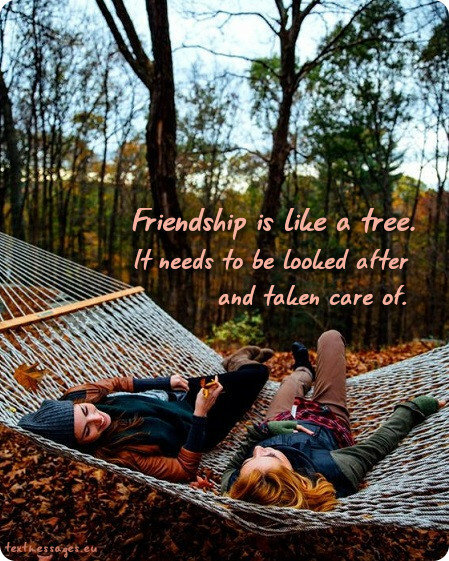 Friendship needs to be looked after and taken care of. The best friends don‘t need to have the same characters. 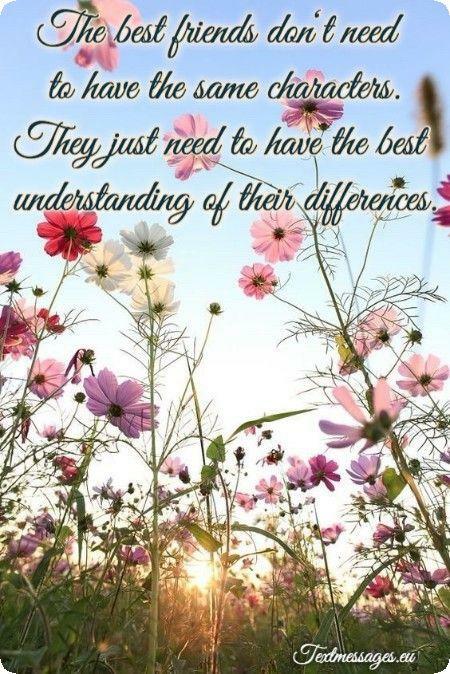 They just need to have the best understanding of their differences. Friendship is not just a word or some kind of liability. 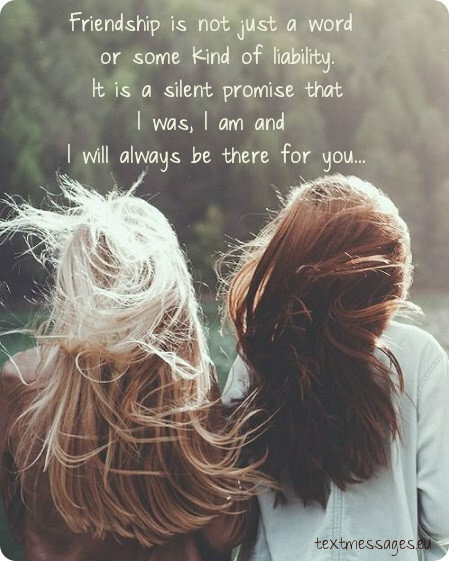 It is a silent promise that I was, I am and I will always be there for you. If I had an opportunity to have all the money in the world, I would never take it. Because for me, there’s no more valuable thing on the Earth than real friendship. You realize that you have the best friend only when you both spend a sleepless night because there are so many significant things to talk about. A fusion of souls is what real friends feel every time when they open their heart. 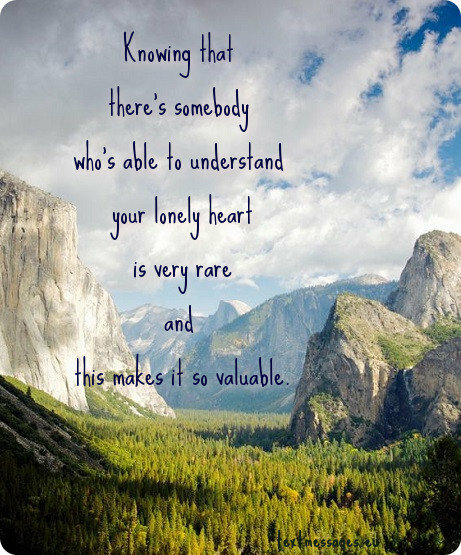 Knowing that there’s somebody who’s able to understand your lonely heart is very, very rare and this makes it so valuable and special. We need to learn how to choose friends. But we will never learn how to choose best friends, because they are sent to us by providence. They are the missing pieces of ourselves, our souls and hearts. How do we tell a best friend from a good mate? They both can feel your mood, but the best friend always looks deeper. He always knows the reason of your happiness or sadness. 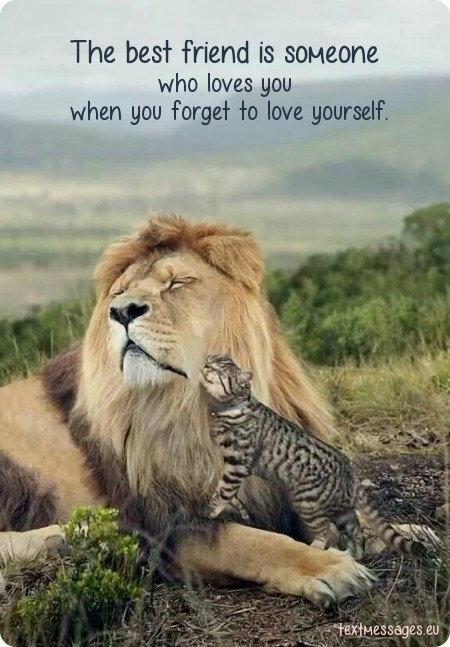 He loves you even when you forget to love yourself. Best friend is someone who will share a lonely Friday evening with you and make your melancholy go away. Best friend is someone who will give you a shelter when you need to feel safe and warm. 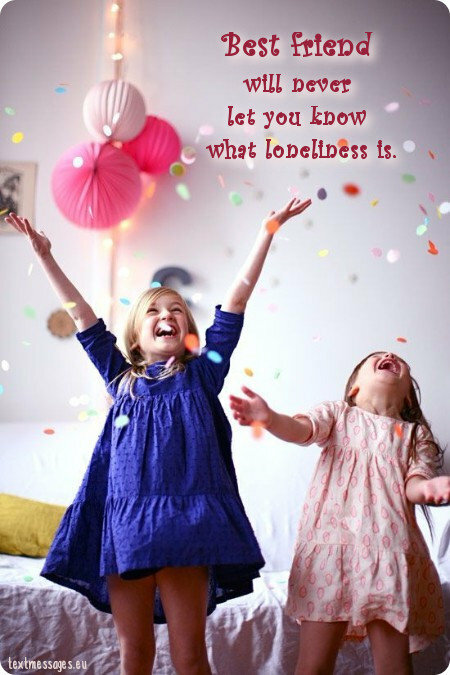 In other words,best friend will never let you know what loneliness is. 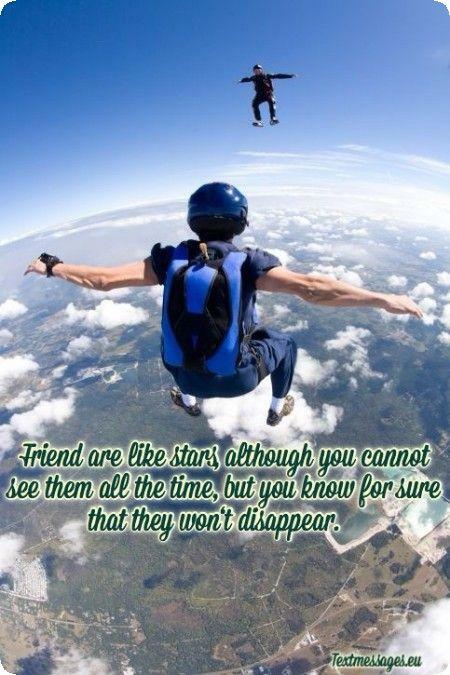 Friend are like stars, although you cannot see them all the time, but you know for sure that they won‘t disappear. Real friendship is the best cure for loneliness. I fell so grateful for having such a great friend like you. When I feel that nothing is under control and the entire world is falling apart, I go to the only safe place on the Earth I know. And this place is your house. 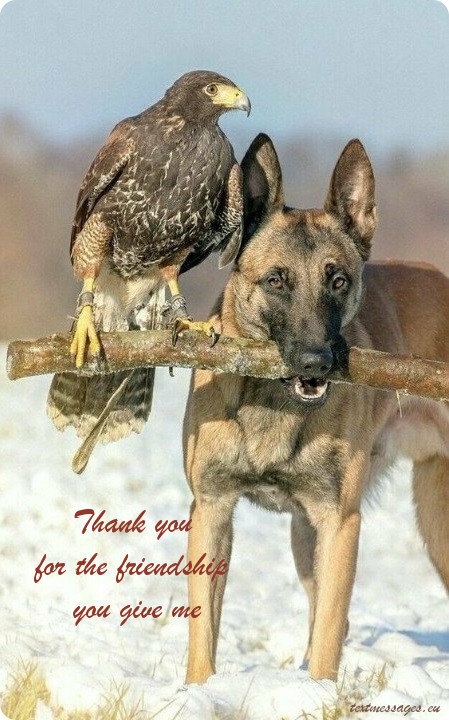 Thank you for the friendship you give me. Actually, we don’t need any therapists. 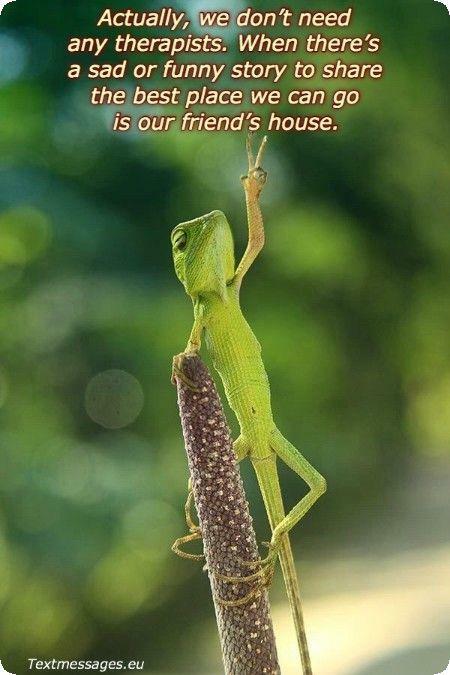 When there’s a sad or funny story to share the best place we can go is our friend’s house. Heart-to heart chats over a cup of tea are everything we need to get better. True friendship doesn‘t need any proofs or promises. It has no demands nor expectations. 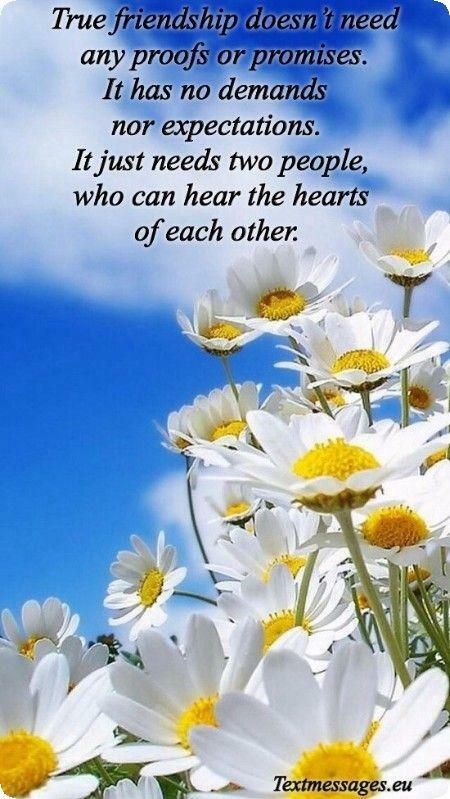 It just needs two people, who can hear the hearts of each other. 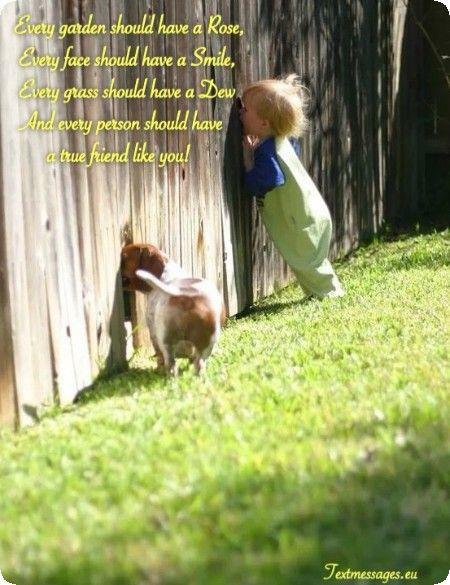 And every person should have a true friend like you! Friendship is a great gift that has to be cherished with love and care. 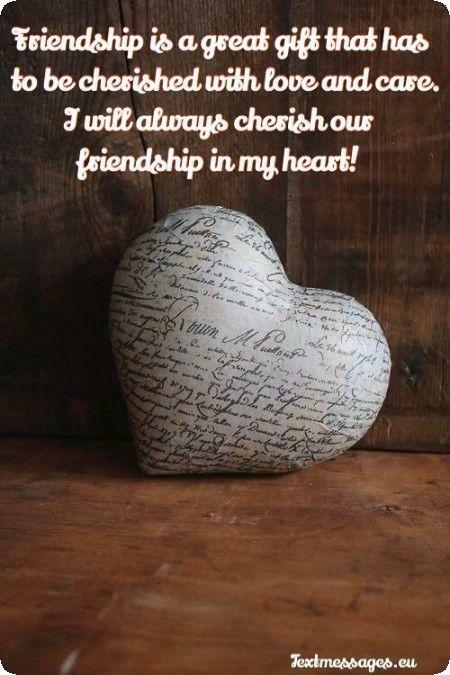 I will always cherish our friendship in my heart! 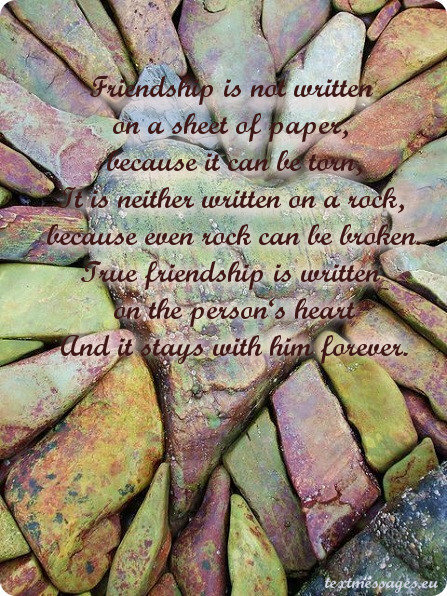 It is neither written on a rock, cause even rock can be broken. And it stays with him forever. 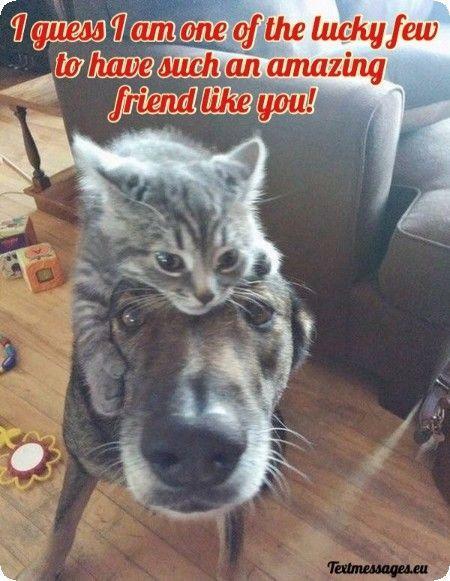 To have such an amazing friend like you! True friendship is not a demonstration of care by sending messages and calling. 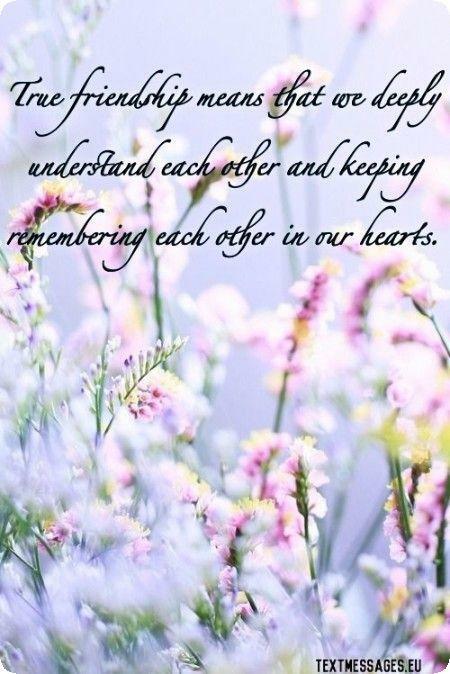 True friendship means that we deeply understand each other and keep remembering each other in our hearts.